It’s been showery and cool, not at all like August. As the occasional red acer leaf drops to the ground, and the swallows gather before flying south, I get the distinct impression that summer is coming to an end. I experimented with the wide-angled lens for today’s photo, hence the blurry bits! Now that takes a lot of skill if you ask me, so I think he deserves as many as he can eat. He invited a couple of friends one morning though – two smaller ones with their coats already turning darker as they do in winter. 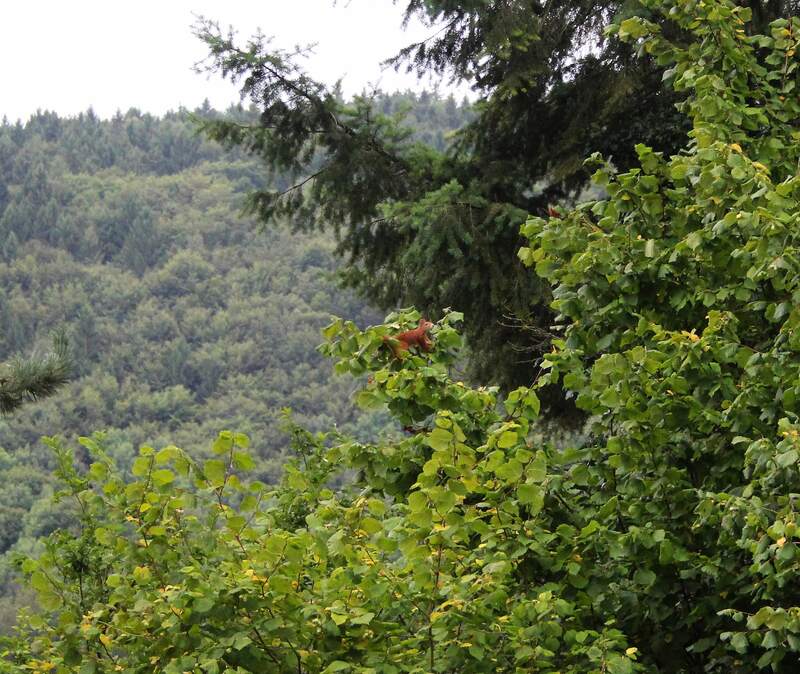 Fortunately we don’t have the non-native grey squirrels in Germany yet, so these red ones are safe for now. (The grey ones carry a virus that can kill our native red ones). Here he is, a bit closer…. sweet, don’t you think? I wonder how many nuts will be left for us! Have you seen signs that summer is coming to a close? This entry was posted in Animals/Creatures, Days, Garden, Nature, Tuesday View, Wildlife and tagged Animals/Creatures, Garden, Nature, Seasons, Summer, The Tuesday View, Wildlife. Bookmark the permalink. Looks more like July, or even June, than August! So much fresh greenery. And with the showers and cool weather I’d say it feels like April or May! LOL! Your slope is looking better and better. I just can’t bring myself to admire the squirrel except as a concession to your kind nature. Maybe the red ones are nice–it is cute, I admit. Fortunately we have the space here for them to spread out and not become a nuisance, and there are still relatively few in urban areas. From what I’ve heard in the uk for example the grey ones are more of a problem. The view looks vibrant and full of colour, not autumnal at all. I didn’t know the grey squirrels carried a virus I thought they were just able to out-compete the reds, who require more specific foods. 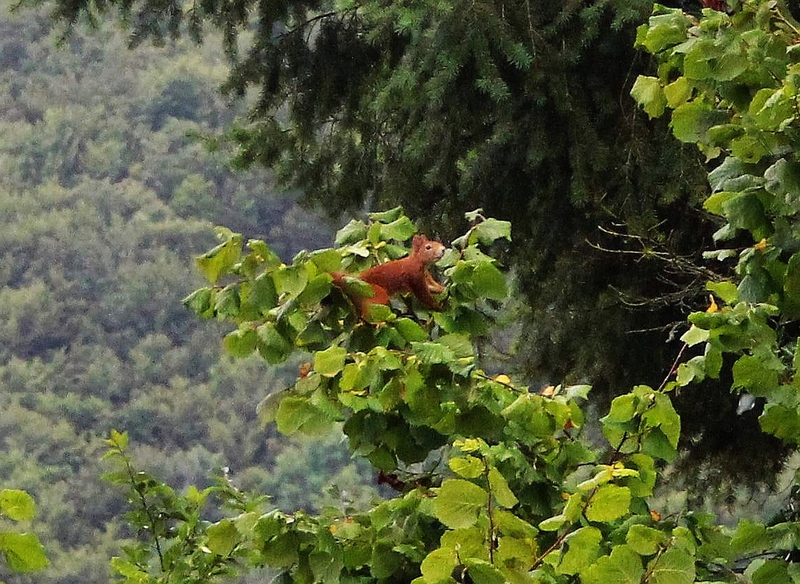 In the UK it is hard to see red squirrels; in Italy we have the red ones like you but I have’nt seen any around where I live but I expect they are a pest where they grow hazel nuts commercially just above Lake Vico, about 10 miles away. Oh I loved the red squirrels merrily eating acorns in the autumnal parks of my childhood in N Europe: had many a scratchy and noisy fight since I wanted them too for play material!! I always seemed to come off second best but I still thought they were beautiful! I cannot imagine that autumn is around the corner for you: somehow summer barely started!! We are a week off our spring and magnolias are in full bloom . . . . temperatures still cool at about 18 – 20 C . . .
Our temperatures are about the same as yours Eha! Autumn for us, but spring for you – how lovely to see Magnolias! Enjoy your spring garden Eha! Great shot Cathy, as you know we have only a couple of areas where the Red squirrel still survives, I have got used to the grey ones but wow, what a fabulous sight the Red squirrels are. Its getting cooler here too, we even lit a fire two evening ago. Same here… very cool nights and no more August heat. The red squirrels are pretty – especially in winter when they grow orange whiskers on their ears that stick up! 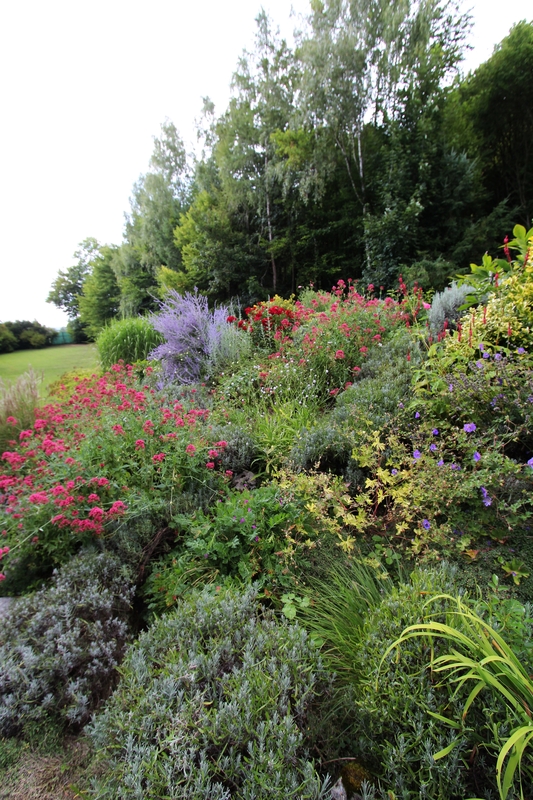 You garden looks consistently good and hardly a hint of the end of the summer despite the indifferent weather. Lovely to have red squirrels and hazelnuts; I hope there is enough to share! I’m hoping so too, but I doubt there will be many left at the rate they are disappearing! I don’t mind if they eat just the ones high up that we can’t reach, but get annoyed when I see unripe ones uneaten on the ground! A couple of days ago I have seen two young red squirrels running, playing, having fun in old oak trees. They are so cute! Many migratory birds, as White Storks, are gone. Autumn is the air. We still have swallows, but any day now they will be gone, I know. It is so cool at night now too. All in all it was a lovely summer though! What a wonderful colour that red squirrel is, I once caught a glimpse of one on Brownsea Island in Poole Harbour, otherwise I just have to settle for the greys. I suppose I take them for granted now. Isn’t it sad there are hardly any left in Britain now. I just hope the grey ones don’t make it over the English Channel or Alps, as I believe they are only in the UK and Italy so far. Lovely photos, and the squirrel is a very bright red. We have red squirrels here in Northern New York, and they are worse than our grey squirrels. They get into homes (attic spaces), garages, and sheds, and chew everything up. Not sure if they are the same variety of red squirrel though. Hi Sue! That sounds like the American equivalent of our dormice…. cute but such pests if they get in the house! I looked it up and it seems your red squirrels are a different species to ours. They look quite similar, but perhaps a bit smaller and not as red as ours. Thanks for your comment Sue! You are so fortunate to still have the red squirrel and no greys. No signs of autumn here yet – apart my woollen jumpers leaping from the ironing basket where they have languished for the past couple of months and onto the ironing board. It must be a natural migratory pattern. Let’s hope the grey ones stay where they are! Love the description of your migrating pullovers! Our summer went out with a bang, I fear – our heatwave abruptly ended a couple of days ago and it’s now rainy and very, very cool (only plus 11 degrees Celsius as the high today!). The rosehips are colouring ever so slightly and there are racks and racks of chrysanthemums for sales in the stores (an autumn staple here!). I’m having a difficult time transitioning to the cold and damp. That is rather chilly Sheryl… our night-time temperatures are now below 10°C and summer has definitely come to an abrupt end here too, but we manage to hit 20° most days still. In a sheltered spot! Glad you are still getting summer warmth. It’s decidedly chilly here now! The squirrels are currently out and about again – hazelnuts for breakfast! Your little guy has a much redder coat than my backyard marauders. 🙂 Our local squirrels are kind of brown and grey–like the landscape, I suppose. And it’s funny, but our weather is still hot as blazes and will be for another two months, but the seasons still go by their own clock. Our oak tree begins to drop acorns and the squirrels get very busy, and after 40 years in the same house with the same large oak tree…I KNOW that summer is coming to a close. 🙂 I’m not sure I’m ready for that, Cathy! Isn’t that strange? That you still have the heat but autumn still comes! The trees lose their leaves here when the hours of daylight drop, but it seems they are turning yellow a little too early this year. I’m hoping it will be a long slow process this autumn, so we can enjoy it! Yes, I have the impression too that summer slowly is coming to an end. Colder nights and days and yellow leaves falling down from the lime-tree are infallible signs. Two squirrels, a red and a darkbrown one, are busily harvesting hazelnuts in our hazel tree in front of the house. Thank you Elisabeth. Hope your weekend is a happy one too! That little rascal is agile! They are incredibly quick too, and on the alert the whole time, as if they suspect they are stealing and may be caught at it! I also had to look up the differences between your red and ours. I think yours is much showier with those ear tufts and darker red color! I bet they both share the same twitchy little animal characteristics though. There’s surely still time for autumn planting anyway. I hope September doesn’t fly by like August is doing! Leaves have begun to turn along with the rain and cool weather. Summer is sadly coming to a close here too. Very cool again today, and rain forecast! I keep hearing of new methods for keeping them off birdtables/feeders etc, and hear the grey ones are certainly not shy whereas the red ones never try and get too close. Very cool here today – actually i’d say cold!